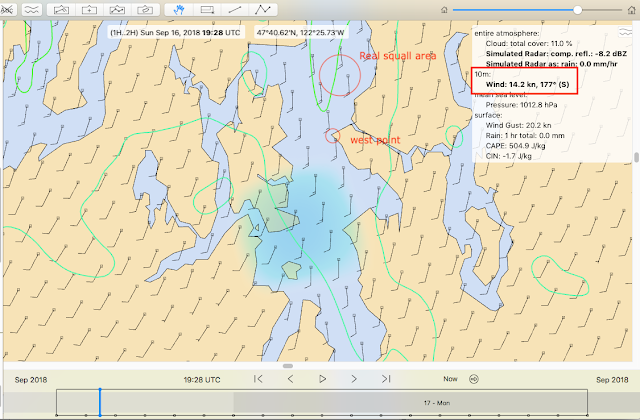 Squall Forecasting in Puget Sound... Maybe. We had a very pleasant surprise visit in the office today from sailing and weather expert Bruce Hedrick, during which the discussion of local squalls came up, which reminded me of an example from a couple months ago, which at the time seemed to me a peek into the future of squall forecasting. 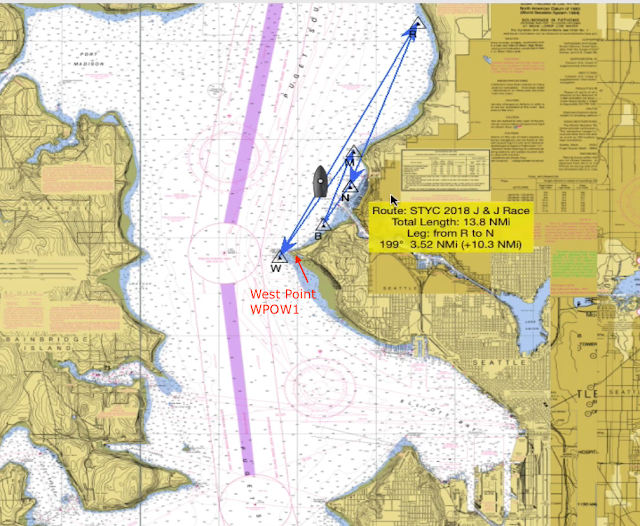 This one occured on Sept 16, 2018, during the J&J race from STYC. 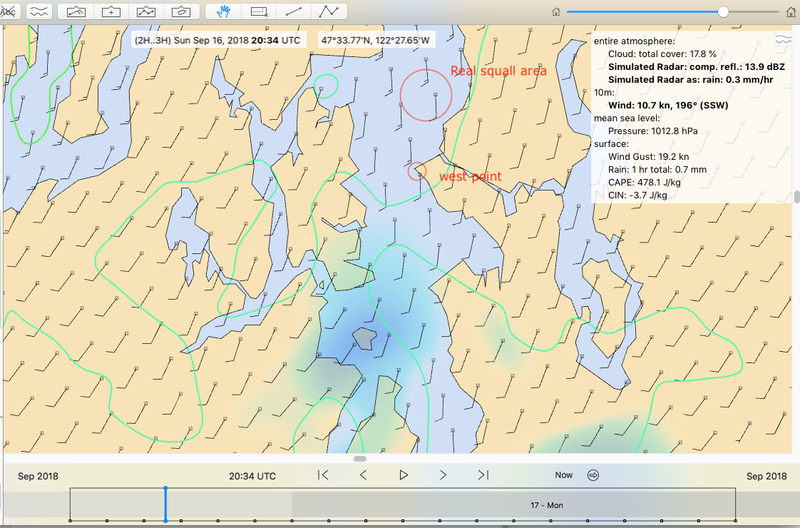 It started with a bike ride home in the afternoon noting what fine sailing weather we had as a race was going on in the Sound, off Shilshole Bay. Then once at home I saw the same fleet hit by a sudden squall, which was gone in 15 min or so. Perhaps one of Bruce's racing column readers was sailing that race and can tell us more about what they observed. This took place between about 1:15 and 1:30 PM, on Sunday, Sept 16. At the time I made a video to document the observation; this note is a summary of that video, which was longer than needed... too much talking! Plus a couple new notes. The boats affected that I saw were at the location of the vessel icon in the picture below. The thought that occured to me at the time was: did this squall show up in the new forecasts of simulated weather radar? 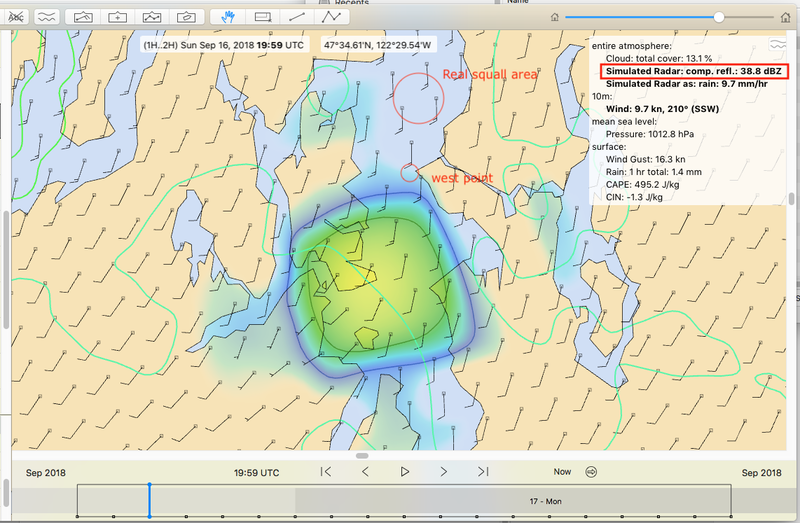 These forecasts are available in the HRRR forecasts, and promise to be a key parameter for inland and coastal sailing, in that they should be able to forecast squalls in an easy to understand manner. This parameter is also available offshore in FV3-GFS data. We discuss this parameter and how to use it in our textbook Modern Marine Weather, 3rd Ed. Much of the HRRR data is available from third party sources beyond using direct access from NCEP, but to my knowledge the only GRIB viewer that can seamlessly download and then display this special parameter is LuckGrib, available for Mac or iPad, which we used for this study. The only nav program I know of that will do this is Expedition (v10.9.17.1 or newer... a 10.9.18 beta). 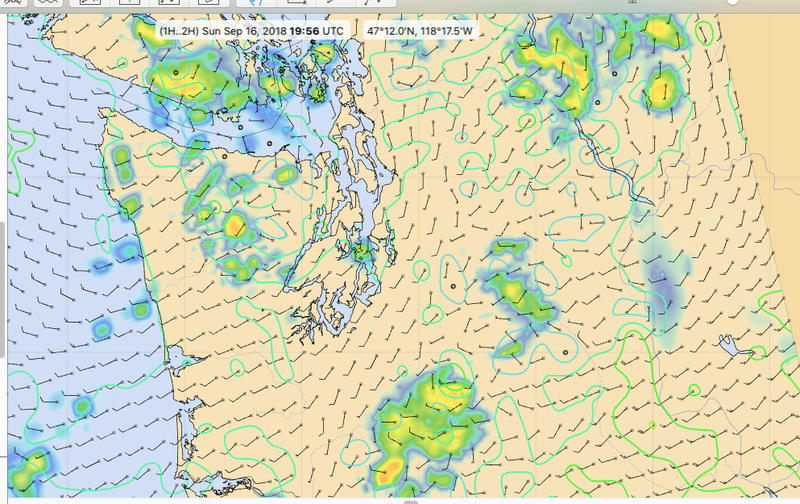 Below we see that the wind over this part of the Sound prior to the squall was well forecsted by HRRR which we can tell by comparison with the NDBC winds from West Point Lighthouse (WPOW1), shown below... captured from the video. Here the cursor is over the squall showing reflectivity of about 39 dbZ, explained shortly in a table below. Then 30 min more at 1:30 the squall is gone, and the wind is back to about what it was, but a bit lighter, which is actually seen as well in the lighthouse winds. This forecasted squall was not at the right place... i.e., where I saw the boats encounter it. 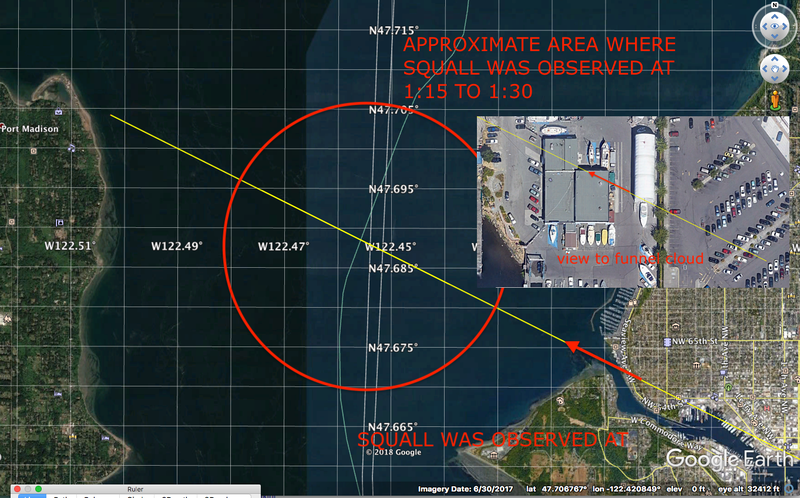 It was about 5 to 6 miles south of the observed area... but I must say I could only observe the area marked above; i do not know what happened in this region to the south. But this forecasted squall was about at the right time, maybe 15 min earlier.... if of course there was any real correlation between this forecast and this actual squall. There is another note to make about conditions at this time on this day, but first let's look at a page from our text book that describes this simulated radar data and gives a real, confirmed example from Spain. 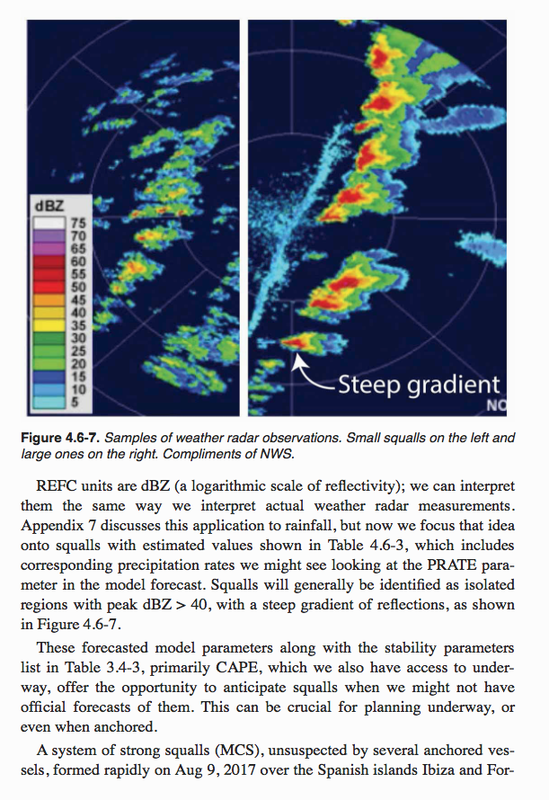 Here are a couple pages from Chapter 4 of our book that shows the reflectivity scale that we made to use with this new REFC data. This is not official in any sense. 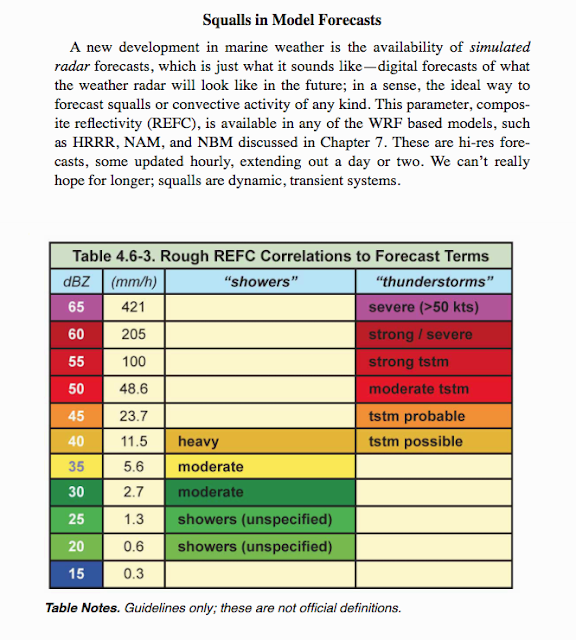 We made this as a guide to interpreting weather radar images for all types of rain, and then apply it to this data. The REFC values we saw in the forecast were about 39 dbz, which is on the border between showers and thunderstorms—I do not recall any rain with this system; maybe we will learn something from those who actually experienced it. In any event, if we were planning this race before the start, we could have looked at the HRRR data and maybe even the NAM CONUS (3 km)—not every one offers this latter model, but LuckGrib does, and we would have seen something more generally like the one capture below. The forecast was for very unstable air with showers crossing the region. With LuckGrib you can mark a point and ask for a meteogram of any parameter. Here is what the REFC looked like in that part of the Sound. For what it is worth, we see that the likelihood of squalls peaking out right at race time! Again, though, this could be all coincidence. 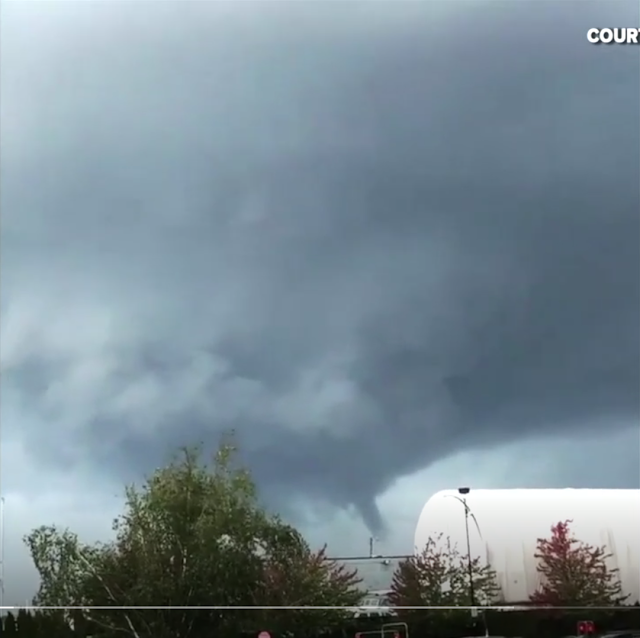 The instability of the air at race time, however, was documented in another, rather dramatic manner caught on film from the parking lot at Fred Meyers. This was filmed at almost the same time I saw the boats affected, but again, there is not a direct link. I have lost the reference but my FB page says it was identified as "about 1230." Not sure where that came from. This is the perspective in the video of the cloud. This then extends across or toward almost the identical location that I was watching the squall hit the boats. This is clearly circumstantial evidence. 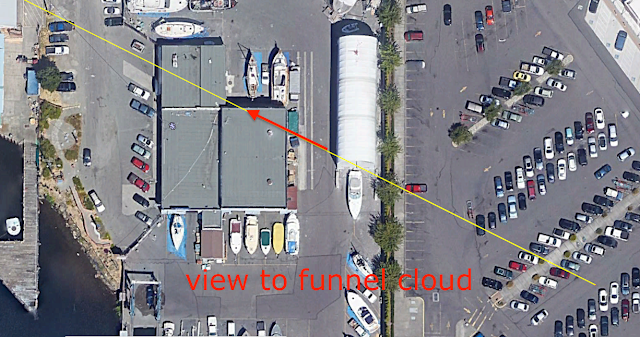 We have no specific distance information from the cloud image. It could have been over the Fisherman's Terminal. But such clouds do indicate notable instability, and the squall that I saw was a clear example of that. So that is the story. Next step is to start using this REFC data to check conditions before races to see if we can learn more. And again, if anyone was in that race who can share some experiences, please post a comment or call us at the school 206-783-1414. Thanks. PS. LuckGrib now has a full functioning free trial period for Mac or iPad, so folks can experiment with these exotic GRIB files... plus get access to the best wind data available. Satellite data are crucial to modern marine weather. The most direct use we have comes from scatterometer wind measurements that give us surface wind speed and direction worldwide. 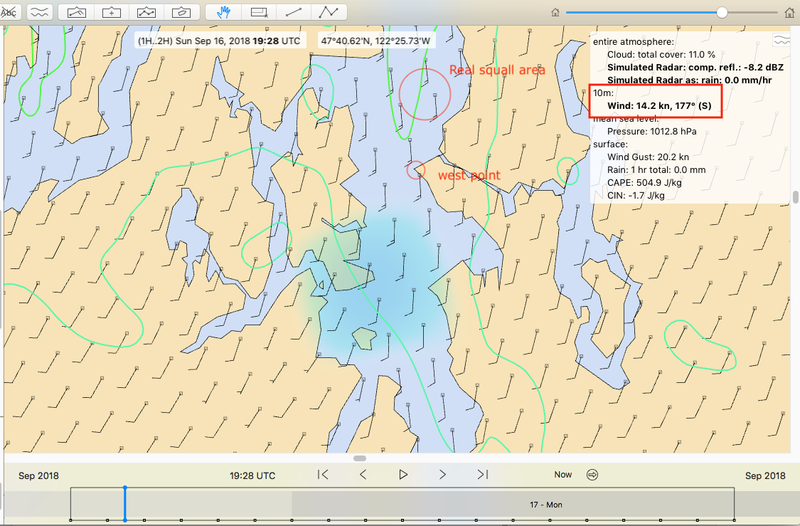 We get near-live measurements somewhere close enough to us to be helpful for navigation planning every few hours. Google ASCAT to get to the main page of graphic data. We can also get the ASCAT data in GRIB format. The ASCAT data are from satellites in low polar orbits. The earth rotates below them, so they eventually look down upon all points on earth in their typical 103 minute periods. Other satellites in these low orbits measure sea surface temperature and the height of the sea surface, which can be used to compute ocean currents. We also can get the resulting ocean current forecasts in GRIB format. Another type of satellite is in a much higher orbit specifically chosen so it circles the earth at exactly the same rate that the earth rotates below it. These are called geosynchronous satellites. They are effectively fixed in space relative to the earth, always viewing the same hemisphere below them. These are the satellites that give mariners a detailed look at the cloud cover every hour or so. 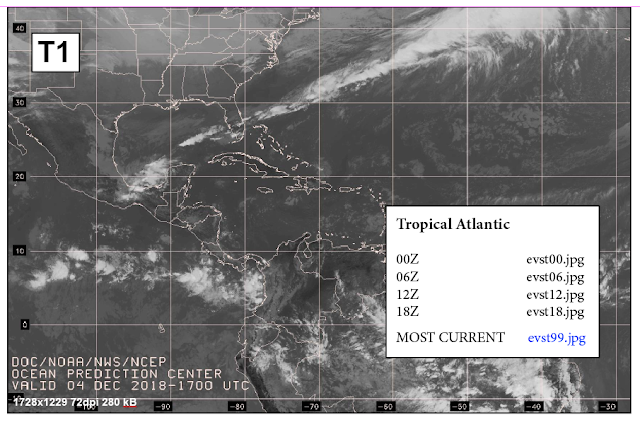 The United States, Europe, and Japan offer GOES (Geostationary Satellite Imagery) data. The NOAA GOES Server provides access to many of the available images, and these are the primary source for the images that can be requested by email underway—some are available in reasonable size, others are too large for frequent download when underway. All are available by HF radiofax. 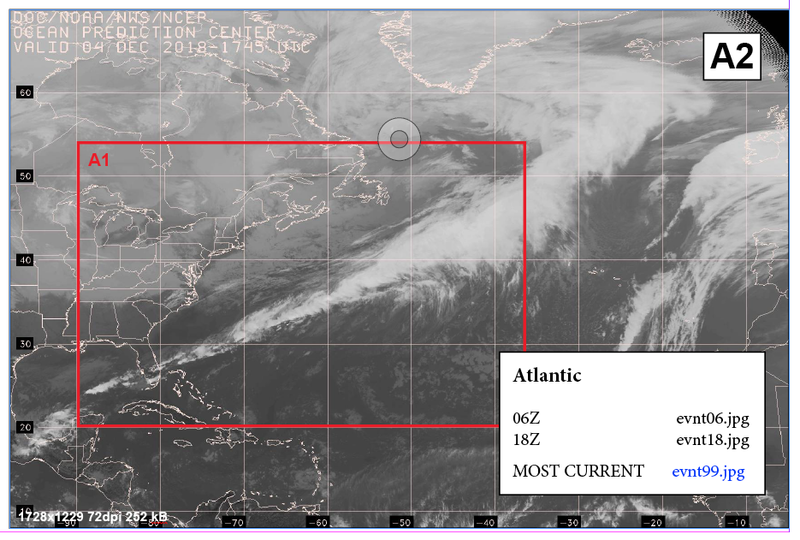 Satellite cloud images are not often the primary source of weather information we need for decision making underway. 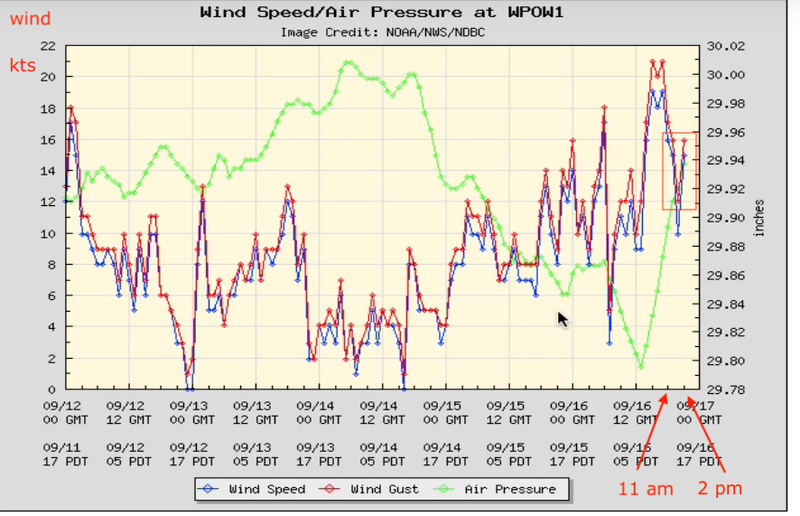 Primarily we need accurate wind forecasts. But in some circumstances clouds provide crucial information that enhance our understanding of what is taking place and what to do about it. In the presence of tropical storms or prominent fronts, the cloud images are the truth meters that tell us where the systems are. 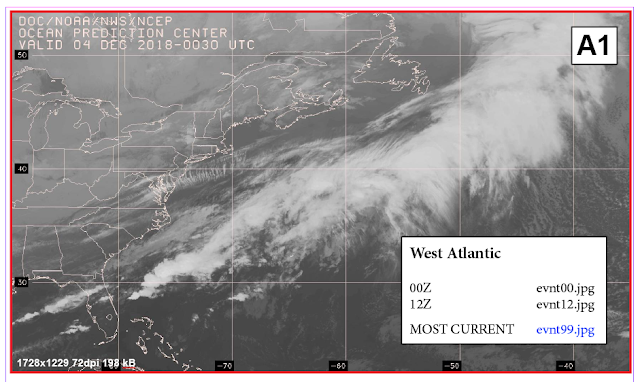 The models and the forecasters tell us where they think they are, but the cloud pictures and the ASCAT wind data tell us where they really are. Cloud images are much like radar. Electronic tools on our echart displays can tell us from a GPS input the range and bearing to an islet, but that is not nearly so reassuring as the range and bearing we measure on the radar screen. 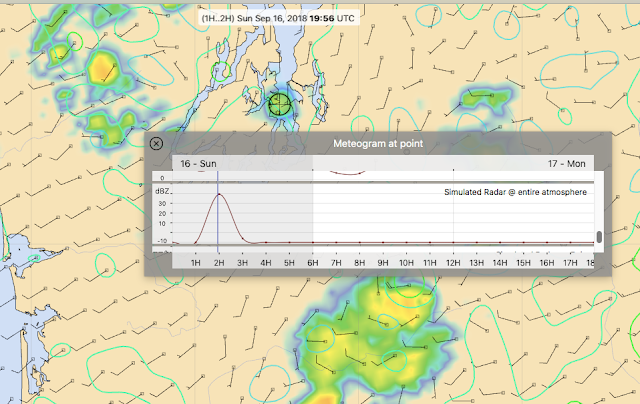 On the radar we are seeing it; on the echart we are computing it based on other inputs.... the GPS signal, the heading sensor, the chart datum, etc. Besides getting positive information on our location relative to the system, clouds can also help us understand the winds we are seeing. Fronts do not show up in model forecasts, and sometimes the fronts we see in forecast maps cannot be discerned as strong or weak on the map alone, but the clouds can often clarify that. Below is a sample (without fronts). Figure 1. 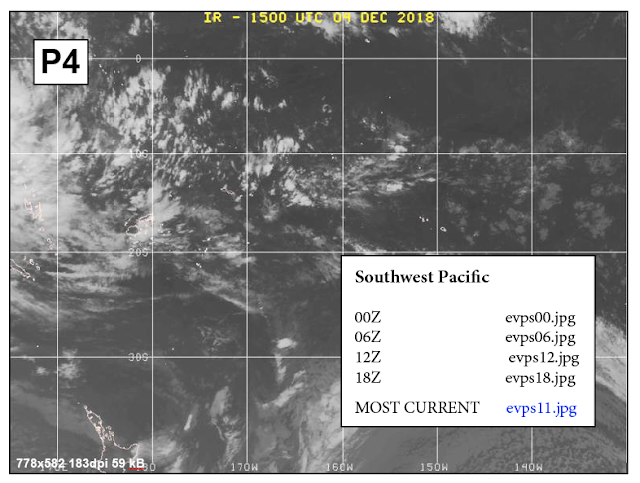 Infrared sat image over Tropical East Pacific (evpn10.jpg). Several areas of convection stand out, which we can study with other tools for tactical information. In another note we go over how this and other cloud images can be used underway, but for now our main goal is to provide a roadmap or "briefings page" for the maps available by HF radiofax or by email request from saildocs or FTPmail. There are many options, and the official presentation is confusing. Our goal is to force some logic and understanding onto that system. And may I say, right up front, this was a tedious task. There may be reasons the system ended up so confusing, but we are hard pressed to see it. 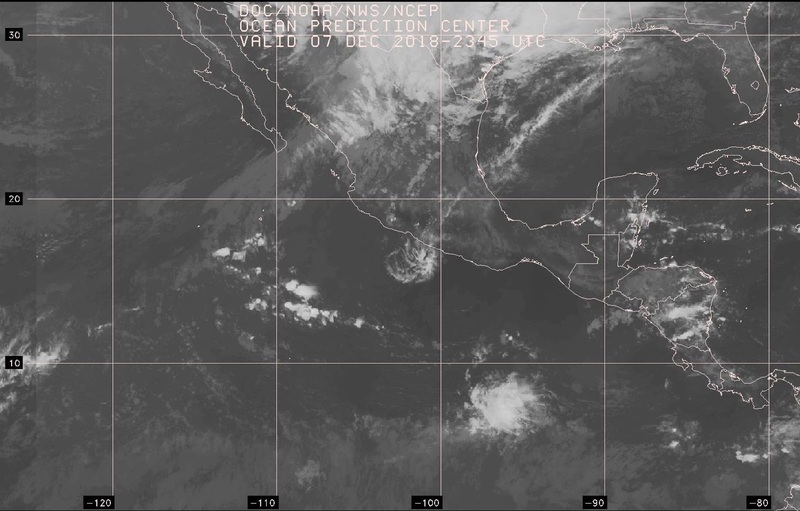 We hope that mariners find this "Sat-image Briefings" file a useful tool for accessing the images and knowing what is available. The outline below shows what we have done; you can then download the interactive file (Sat-Image-Briefing.pdf) to store on your own computer or mobile device along with the Pacific and Atlantic map briefings. 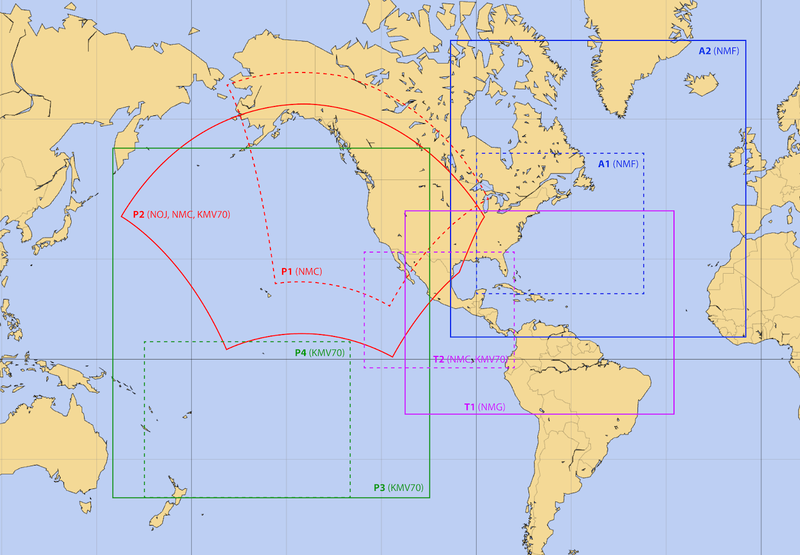 These images can be obtained by email request to saildocs or by direct request via FTPmail at any time, or they can be received by HF radiofax, which requires tuning into the right frequency on the HF radio at the right time. Most of these images are updated 4 times a day, somewhere near the synoptic times so they can be compared to the surface analyses. Some, however, are only offered twice a day on the HF rfax broadcasts. Most are infrared images, meaning the gray scale spectrum in the images represents different cloud temperatures, and since the air temperature goes down with increasing altitude, the color reflects the height of the clouds. The whiter, the higher. There is, however, the occasional visual image included in the sequence, which is indicated in some of the lists but not all. The visual images have higher resolution. In our presentation, you can assume all are IR, unless noted as VIS. Below is a summary of all images available, organized by the HF rfax broadcast stations. The maps are identified by the map areas given on the rfax broadcast schedules, as well as our own (Starpath) ID, which we add to simplify the cross referencing. Each of these maps has a most recent file name, which can be requested by email. These schedules were last updated in Sept, 2018. Latest versions are presented in a document that has been called rfax.pdf for so many years that you can find it you google that file name. 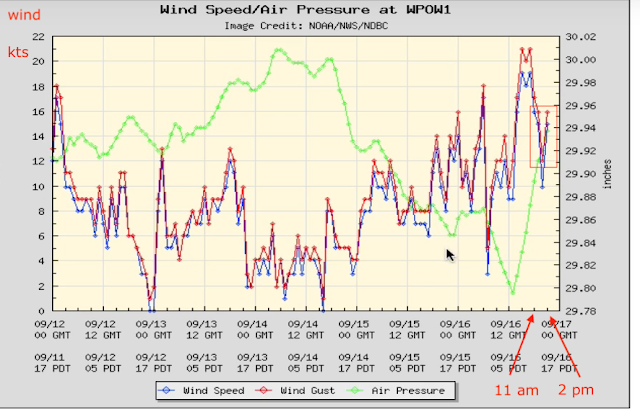 Various versions of it are also online: one at the OPC and others at weather.gov/marine. 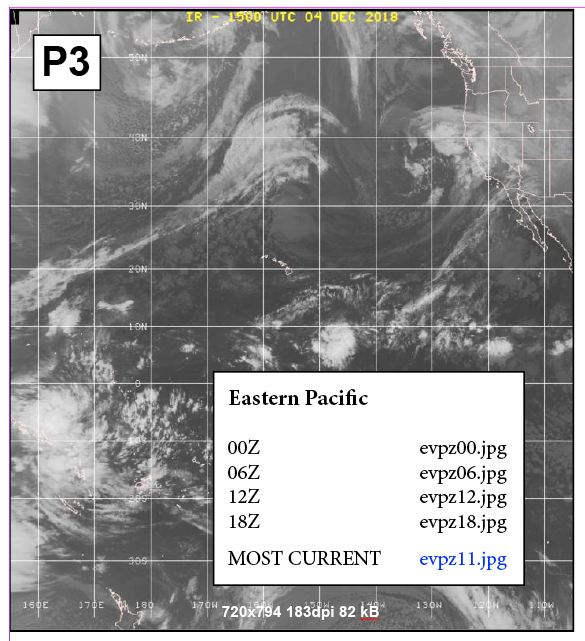 The rfax.pdf file is a preferred source as it also includes (in an appendix) interactive instructions for requesting the maps and images by email. However, with that said, to highlight the issues we are dealing with, the latest rfax.pdf is dated on the cover "Sept 7, 2018," whereas within the document itself it says the schedules we care about here were updated Sept 19. The file names listed here are not used at all for HF radiofax downloads, but these are needed to request the files by email. We list them here for cross reference to the images below. Images are typically available for download about 30 min after the valid synoptic time of the image. In some cases the actual valid time is 15 or 30 min before the synoptic times listed. In most cases, the images are broadcast four times a day, at two specific times, AM and PM, on a 12 hr clock, e.g., NMG images are 2:00 and 8:00, AM and PM, but there are notable exceptions. From the Atlantic station NMF (Boston), the area covered by image A1 is broadcast four times a day, but in different images (A1 and A2, which includes A1), whereas the rest of image A2 is only available by HF rfax twice a day. You can still get the images by email request four times a day, but there is a twist to using the "most current" file, see  below. 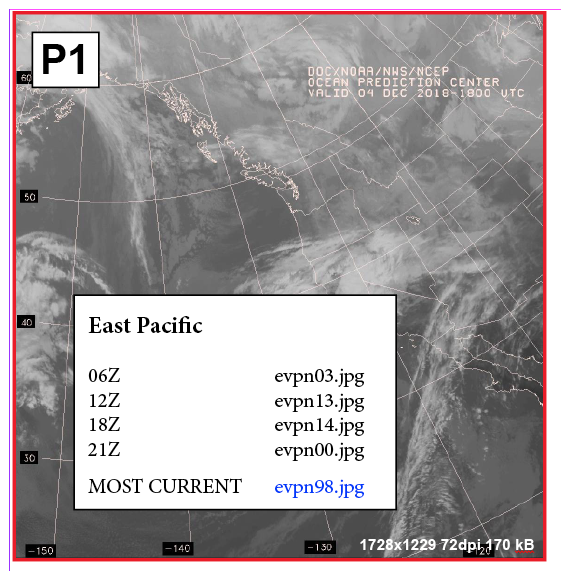 When requesting images by email, each image area (P1, T1, etc) has a unique "most current" file name that will send you the requested area for the most recent synoptic time that is available, in all cases except the most current file for the two areas broadcast from NMF (A1 and A2). This most current file (evnt99.jpg) alternates between A1 and A2. At 00z and 12z the file evnt99.jpg will get you an A1 image, whereas at 06z and 18z you will get an A2 image. This is an anomaly that only happens with this one "most current" file. The two images P1 and P2 are in a polar azimuthal projection. 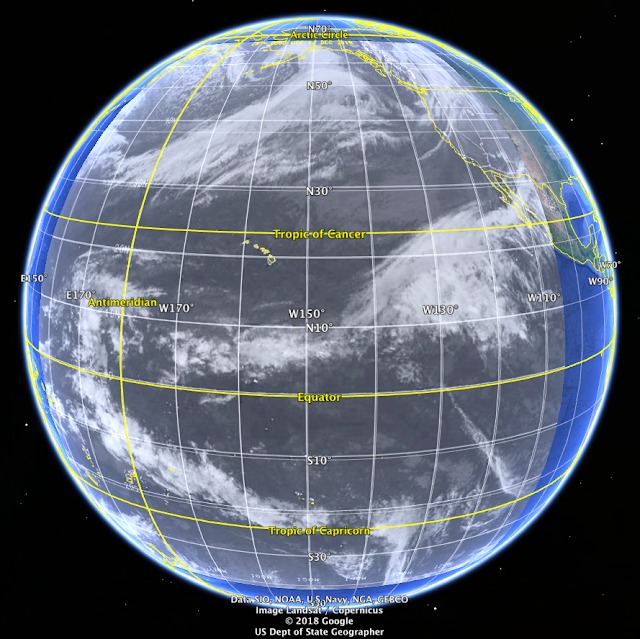 These can be difficult to work with when comparing to weather maps, charts, and GRIB data which are typically in a Mercator projection, but the navigation programs Expedition and OpenCPN are two exceptions in that they automatically download and georeference these as well as they do the other satellite images. The other images are in a rectilinear projection, which is not Mercator, but they do georeference easily in echart programs or Google Earth. 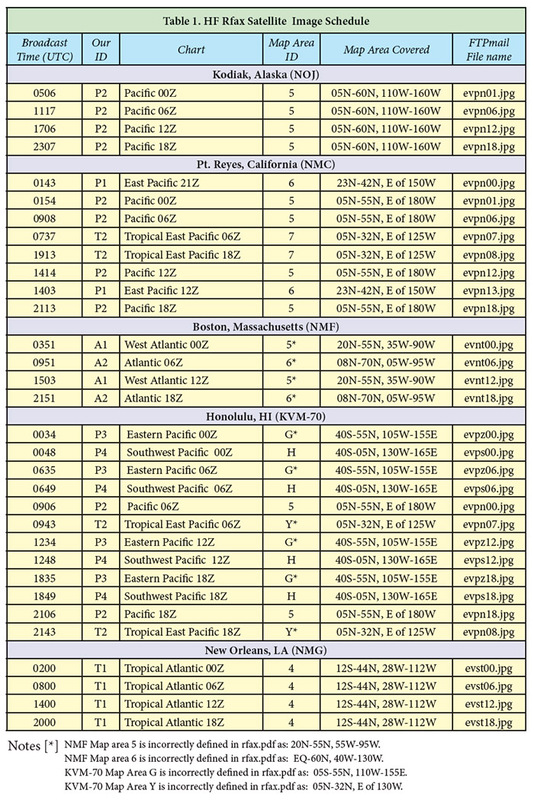 The NWS map area IDs and the regions they cover are listed at the bottom of the rfax schedules. 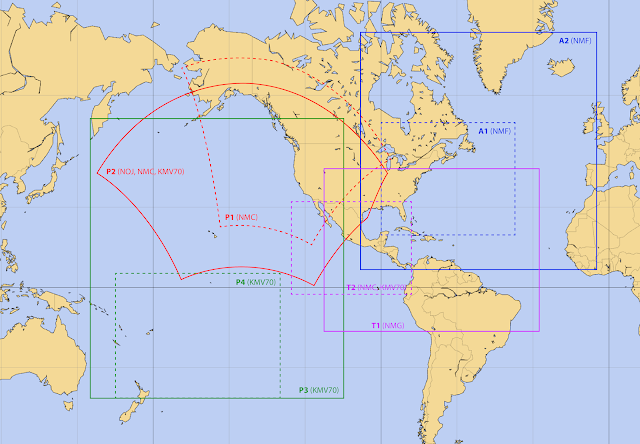 These areas are unique to the individual broadcast stations. NMC Area 6, for example, is a totally different place than NMF Area 6. That is the reason we introduced our own unique labels for these image boundaries—in this example, P1 and A2, respectively. Below are the maps available from the NWS via email request or HF radiofax broadcasts. We made this map using the flexible features of the super GRIB viewer LuckGrib. The rectilinear ones we can just draw in based on the dimensions you see below. To get the polar azimuthal boundaries we georeferenced the images in OpenCPN then make a route along the boundary, then exported the routes as GPX files, which were imported into LuckGrib. We use unique features of LuckGrib to study the weather associated with satellite images in another note. You can see in the graphic above already some structure revealed within this image set. There is a larger and smaller region covered in each ocean. 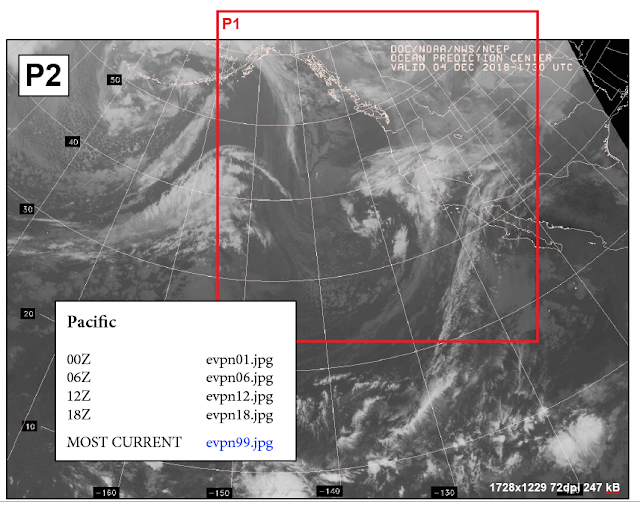 At the end of this note, we have an image that shows that P3 is essentially the full view of the earth from GOES West. You can go to that directory and find the files using the names list below. Each has a most current, which means most current of the synoptic times. Below are the two images, first from a direct link to the URL, and below that the compressed TIF version. In a sense, you do not gain much and you lose a lot, which is not too surprising in that this compression service from Sildocs is intended for weather maps, where it works great, not for sat images. This JPG original file above is 1728 x 1229 at 213 kb. The TIF below is 864 x 614 but only reduced to 184 kb. 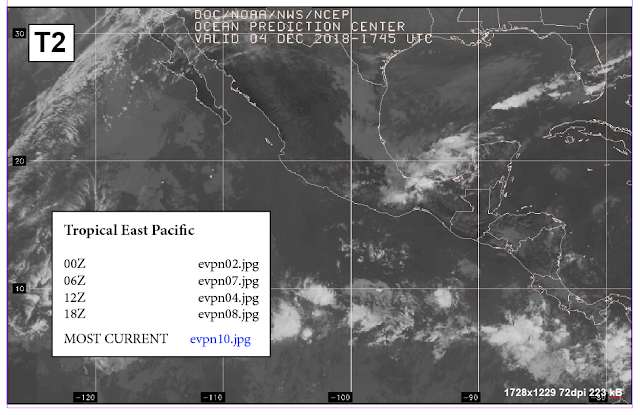 Again, our Sat-Image-Briefing.pdf file includes the basic information above, with live links to the most current images via internet. You can georeference any of the sat images in Google Earth. The sample below shows that the region P3 is essentially the full-disk view from GOES West. Later we add how to access GOES West and East subregions directly. There are also sat images from the aviation weather sector. 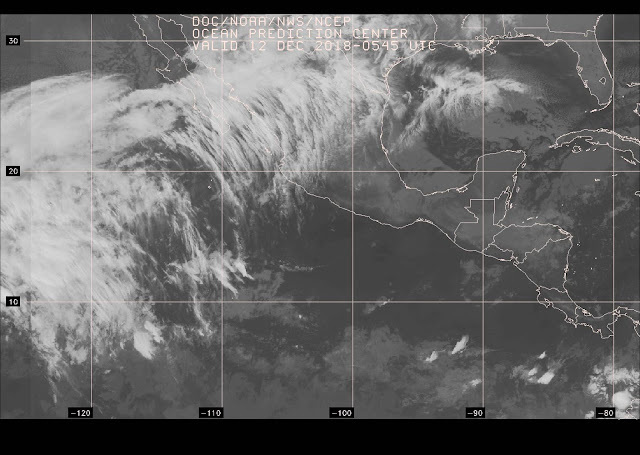 Sat image region P3 georeferenced in Google Earth. If you want this overlay for your own google earth you can get this one we made.